After seeing this in the mail and how small it was I can't believe how fast it has grown and spread! Wintercreeper is an evergreen shrub and can grow as a vine as long you provide support for it, it is native to East Asia. Winter Creeper is best to be grown in moist well-drained soils but will tolerate a wide range of soils except for extremely wet soils. It is often used as ground coverage due to its ability to naturalize. However it has been known to grow out of control and colonize, so it is best to accommodate the growth sensibly and keep it in check this would be the most prominent problem that Winter Creeper has other than Anthracnose and aphids may cause a problem but it is easily managed. 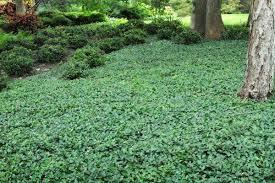 Wintercreepers can grow to become gorgeous ground covers and supplies a beautiful color of green as they grow. They grow to become very thick and dense and is excellent to help with soil erosion problems in some areas. These plants are unusual and remain green during the color winter months when everything seems to be dying out. Native to China, Japan, and Korea, wintercreeper, also known as creeping euonymus (Euonymus fortunei), is an evergreen ground cover that even grows as a climbing vine. This particular vine climbs over anything in its path, including mature trees. Wintercreeper tolerates a wide range of growing conditions. It will grow in full sun to deep shade on acidic soils, low nutrient soils, and basic garden-variety fertile soils. One condition that it does not like is heavy wet soils. Its leaves are glossy dark green, oval-shaped and slightly toothed. The one to two and half-inch-long leaves grow opposite each other on light-colored vines. The small, five-petaled, greenish flowers grow on long, branched stalks and produce little, round, pink-red capsules that expose their seeds when they split open. Wintercreepers also provide lots of gorgeous colors, and the leaves can change to purple and burgundy during the fall months.